I guess I would call my writing in college the point at which I was writing seriously — by which I mean, trying to produce real stories that someone might want to read, or even publish. I’d had encouragement at that point from family and teachers, including a college writing teacher who told me he thought my work was publishable. It wasn’t. I didn’t know that yet, but the encouragement helped keep me going as I ever so slowly learned the craft of storytelling. It would be another six years and a file full of rejections before I sold my first short story (to Fiction magazine, in Boston). If I had realized sooner what I was doing wrong, I might have shortened that learning period considerably. The problem was, I wasn’t telling complete stories. I was going with what people told me were my strengths — description and characterization — and missing the need to tell an interesting story with a beginning, a middle, and an end. I didn’t understand about story structure. I was writing mood pieces, story fragments. 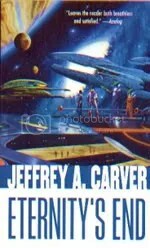 My teachers weren’t really versed in SF, or even in anything resembling conventional storytelling standards, and they weren’t able to give me the direction I needed. 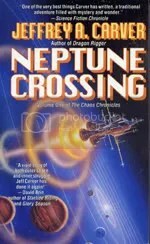 I had no workshop to turn to, and was really writing on my own, with occasional feedback from editors like Terry Carr and Robert Silverberg, who liked my work well enough to at least hint at what they didn’t like, as they returned my stories. It wasn’t until years later that I found a source of good, regular criticism, when I met Craig Gardner and he invited me to join the writing group he was a part of. He and I are still members of that group-thirty years later! And Craig and I now run our own writing workshops in the Boston area. I’d learned just enough about putting a story together, and the craft of writing narrative prose, to make it over the bar to become publishable. Little did I know at that point how much more I had to learn — and am still learning! But I think the turning point was realizing, somewhere deep in the subconscious, that I had to bring an interesting character through a conflict and to a resolution of that conflict. I think I had to find a balance between the ambiguity that was interesting to me and the kind of resolution that was satisfying to a reader. A couple of years ago, I had the opportunity to attend the NASA-sponsored Launchpad Astronomy Workshop in Wyoming. (http://www.launchpadworkshop.org) This is an annual, week-long intensive astronomy course tailored for writers, and covers everything from the basics up through cutting-edge research. A great experience, and one I highly recommend for pro or near-pro writers. 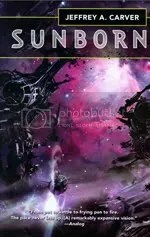 Once Sunborn was done, another year or two down the road, the book was scheduled for publication-and then delayed yet another year for reasons internal to the publishing process. That was pretty frakking hard to take, but it did give me an opportunity to revise some sections after having some months away from the book. The story is a continuing arc, but each volume is a self-contained story that comes to a conclusion — and sets the stage for the next. I worked hard to build enough recap into the early parts of the stories that someone could pick up any book and enjoy it. But no question, the best way to read the series is from the beginning. And I’m just finishing a short video piece for an arts festival (http://www.lydiafair.org/) sponsored by a local church: an audio visualization — for lack of a better term — of the fairly cosmic prologue to Sunborn. 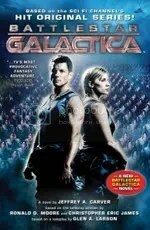 I hope to have that up for online viewing in a few weeks. I’ll put a link on my downloads page once it’s available. It’s 3 minutes long, and I think it’s pretty cool. Stop by and check it out!